New York Times bestselling adult author Luanne Rice makes her dazzling YA debut with this gorgeous, unputdownable story of love, hope, and redemption. When Ruth Ann (Roo) McCabe responds to a text message while she's driving, her life as she knows it ends. The car flips, and Roo winds up in a hospital bed, paralyzed. Silent. Everyone thinks she's in a coma, but Roo has locked-in syndrome--she can see and hear and understand everything around her, but no one knows it. She's trapped inside her own body, screaming to be heard. Mathilda (Tilly) is Roo's sister and best friend. She was the one who texted Roo and inadvertently caused the accident. Now, Tilly must grapple with her overwhelming guilt and her growing feelings for Roo's boyfriend, Newton--the only other person who seems to get what Tilly is going through. 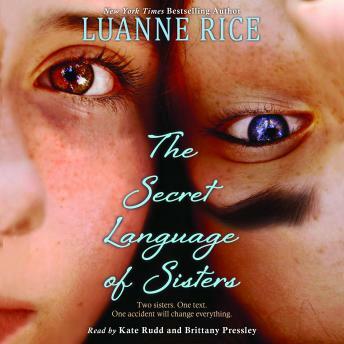 But Tilly might be the only person who can solve the mystery of her sister's condition--who can see through Roo's silence to the truth underneath.